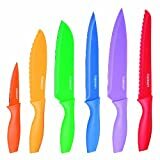 This cool new Electroplated Knife Set will add a splash of color to your kitchen. 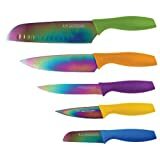 Made from stainless steel and titanium, the knives are available in bright, multi-colors or sleek copper options. 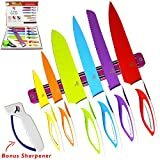 The set of three comes complete with a paring knife, utility knife, and a chef's knife. 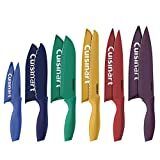 Set includes: Paring knife blade length: 3.5"; Utility knife blade length: 5"; Chef knife blade length: 8"